What is REAL food, really? Eating real food simply means making choices from plant and animal foods that have been cultivated using methods that are minimally intrusive. 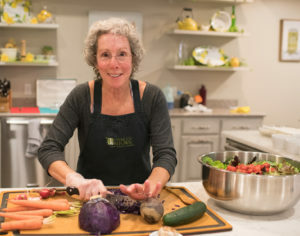 Choosing vegetables and fruit, whole grains, legumes and beans, and animal proteins that have not been exposed to man-made chemicals, food coloring, or GMO techniques in the planting, growing, or post-harvest stages further defines REAL food. All foods are available in this healthful, nourishing, and delicious REAL form. All foods are available in a less healthful, less nourishing, and perhaps less delicious PROCESSED form as well. I am not talking about organic so much as I am referring to foods that, once taken from the land and are being made ready for market, have been laden with salt and other sodium-based preservatives and flavorings, added food dyes, sugars (both real and artificial varieties), and fats–simply to “enhance” the shelf life, flavor, and marketability. Sometimes REAL food may seem to be a bit more expensive at the grocery store than the more processed version; if this is your perspective, I urge you to consider the long-term expense of your health and well-being…investing your resources and forethought into bringing home health promoting foods as opposed to health depleting foods–now–will provide a benefit to you in the future. Imagine this: a small plate that is filled 1/2 with fabulous veggies, 1/4 with a whole grain or other starch, and 1/4 with a sustainably raised animal protein. And then, for dessert: a baked pear, a 2-inch square of apple crisp, or a 1/3 cup serving of whole milk organic ice cream…Yum! Making a conscious decision to avoid commercially processed meats (filled with colorings and high doses of sodium, not to mention growth hormones and antibiotics), veggies and fruits that have sweeteners, salt, or preservatives added, and factory-made desserts loaded with high fructose corn syrup and/or partially hydrogenated oils will get you on the road to eating REAL food. Travel wisely! good input…suggest the similar recommendations in dr. colin campbell, and dr. tom campbell’s “the china study”…thought milk, protein, corn & peanuts were good for you…think again! “The China Study” was a good read, Allen, I learned from it also. All foods are “good for you”, if chosen from a healthful source and eaten in small amounts. That’s the work though, isn’t it? !